NOV 2013 Haas EC400 2-Pallet 4-Axis CNC Horizontal Machining Center s/n 2054226 w/ Haas CNC Controls, 24-Station ATC, CAT-40 Taper Spindle, Renishaw OTS Wireless Intuitive Probing System, 1 Degree Pallet Indexing, 12,000 Max RPM, 30Hp Spindle Motor, 20” x 20” x 20” Cap, Programmable Coolant Nozzle, Chip Augers, USB Port, 816 Power On Hours, 174 Cycle Start Hours. NOV 2013 Haas EC400 2-Pallet 4-Axis CNC Horizontal Machining Center s/n 2054228 w/ Haas CNC Controls, 24-Station ATC, CAT-40 Taper Spindle, Renishaw OTS Wireless Intuitive Probing System, 1 Degree Pallet Indexing, 12,000 Max RPM, 30Hp Spindle Motor, 20” x 20” x 20” Cap, Programmable Coolant Nozzle, Chip Augers, USB Port, 992 Power On Hours, 127 Cycle Start Hours. 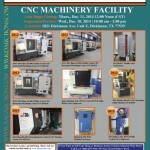 NOV 2013 Haas EC400 2-Pallet 4-Axis CNC Horizontal Machining Center s/n 2054229 w/ Haas CNC Controls, 24-Station ATC, CAT-40 Taper Spindle, Renishaw OTS Wireless Intuitive Probing System, 1 Degree Pallet Indexing, 12,000 Max RPM, 30Hp Spindle Motor, 20” x 20” x 20” Cap, Programmable Coolant Nozzle, Chip Augers, USB Port, 692 Power On Hours, 89 Cycle Start Hours. 2013 Haas DS-30Y Twin Spindle Live Turret CNC Turning Center s/n 3097354, w/ 30Hp Main Spindle, 20Hp Sub Spindle, 12-Station Hybrid Live Turret with High Torque Live Tooling with “C” Axis, Auto Tool Presetter, Parts Catcher, Haas Magazine Bar Feeder, Chip Conveyor. 2013 Makino EDAF2 CNC Die Sinker EDM Machine s/n E70105 w/ Makino MGH6 CNC Controls, FPB2-ED-1 Hand Held Controller, 16-Station ATC, Built in “C” Axis, System 3R Tooling Head, Travels “X”=350mm, “Y”=250mm, “Z”=250mm, 550mm x 350mm Table, 1.9 Metered Hours. Ingersoll Rand mdl. UP6-15c TAS-125 W/D 15Hp Rotary Air Compressor s/n CBV28876 w/ 120 Gallon Tank, 55 CFM, 204 Metered Hours. 2012 Quincy mdl. QTV-54 5Hp Vertical Air Compressor w/ 60 Gallon Tank. Hankison SPX Wall Mounted Air Dryer. Jet mdl. J-8203K 14” Vertical Band Saw s/n 14010028. Jet mdl. HBVS-56 Horizontal Band Saw.